Our 25ml Bach Flower Remedy sets are particularly good for practitioners and therapists. They contain 25ml size bottles of each of the 38 Bach Flower Remedies - from Agrimony to Willow - plus two bottles of Revival Remedy combination. Each remedy is at Stock Level and is handmade for you with love and care and preserved in organic brandy, helping to ensure that we provide you with the best possible quality of remedy. You can choose from a beautiful wooden box or an attractive card presentation box for your set. Handmade with love & care to the original instructions of Dr Edward Bach. 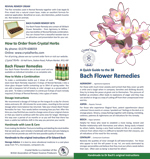 The 38 Bach Flower Remedies make a great tool kit and resource to use with yourself, family & friends or on a professional basis with clients. The Bach Flower Remedies are wonderful, simple and easy to use remedies that can help you to achieve a greater balance and harmony in life. Set Contains 40 Bottles in Total, including: all 38 Bach Flower Remedies: Agrimony, Aspen, Beech, Centaury, Cerato, Cherry Plum, Chestnut Bud, Chicory, Clematis, Crab Apple, Elm, Gentian, Gorse, Heather, Holly, Honeysuckle, Hornbeam, Impatiens, Larch, Mimulus, Mustard, Oak, Olive, Pine, Red Chestnut, Rock Rose, Rock Water, Scleranthus, Star of Bethlehem, Sweet Chestnut, Vervain, Vine, Walnut, Water Violet, White Chestnut, Wild Oat, Wild Rose, Willow and two bottles of Revival Remedy combination. Set Box A choice of a beautiful natural Linden wood box with hinged lid or a sturdy and attractive card presentation box with a lid.